This month is an exciting one for the Velveteers. We have a couple of new wonderful bloggers joining our group and partaking in the challenges. A warm welcome to everyone new and if you are curious as to who, it's at the end of the post. This month's challenge was cause of some excitement for me. The theme was to make tofu from scratch, flavored or plain; firm or squiggly, and then use the same in a sweet or savory dish. Quite frankly, I am a picky tofu eater. It really depends on the dish. 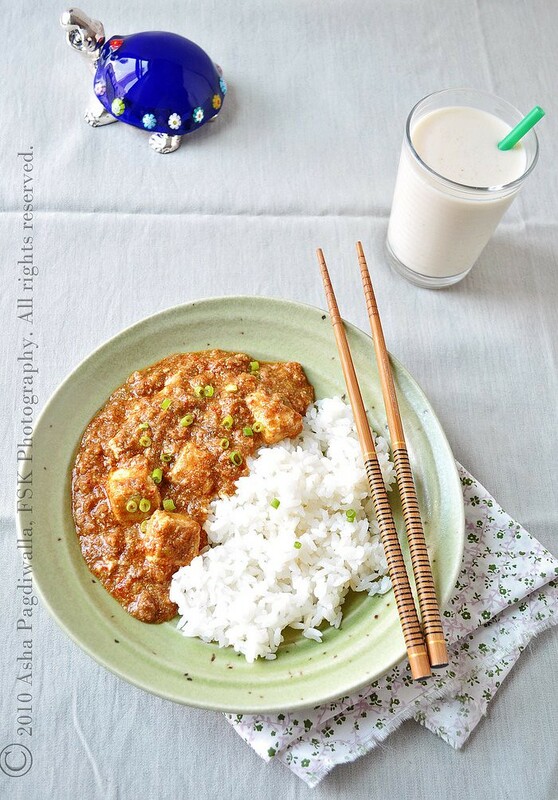 Mapo Tofu is my favorite tofu (?) dish and I have recently had good experiences with dessert tofu. I was hoping homemade tofu would be of a higher quality than store bought. And, fortunately it is!!! When I first thought about the challenge, I was dreading the process, which, I took to be tedious at least. However, a quick google cured me of my fears! The process needs some time planning and dedication from start to end but most of it is just idle time. The actual tofu making doesn't take much longer than making paneer or ricotta at home! 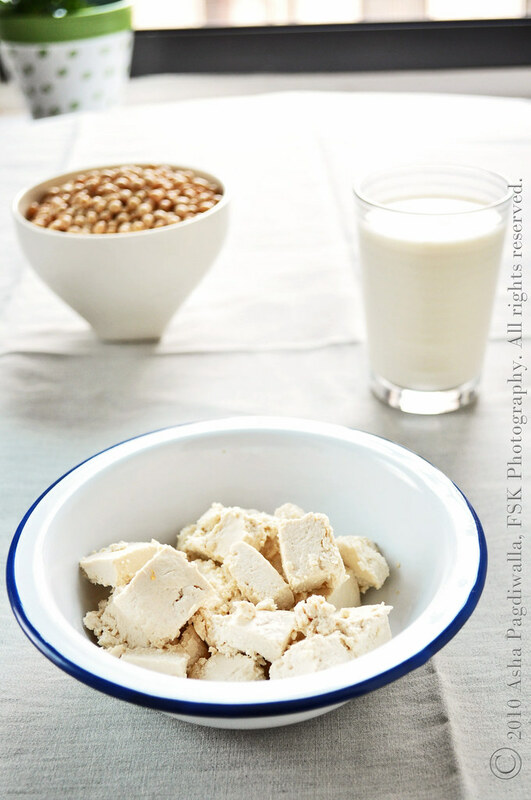 The process of making tofu starts with dehydrated soybeans. I grew up very familiar with these beans as my mom made many a vegetable dish with them and I love the taste of cooked soybeans (I'll share my recipe sometime..). So, I always have a supply of it at home, which, worked provident for this challenge :). 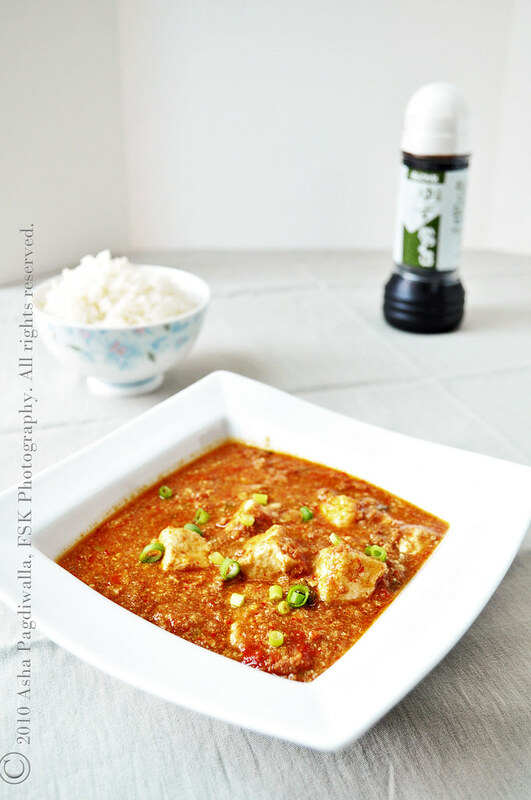 So, just a tad bit of planning and I had fresh tofu Friday night, ready for my Saturday lunch of "Mapu Tofu". The quotes because while the intention was there, the ingredients weren't. So, I substituted for quite a few generously with my creativity and the result although very tasty wasn't in proximity to the desired dish. LOL. Verdict: As I said before, making tofu at home is definitely worth the effort as it tastes much better and ofcourse is free of preservatives etc. The soy milk had a slight grassy taste which did translate into the actual tofu but cooking it in a sauce loses much of the beany-y taste. Also, I used lime juice as a coagulant, so there was tad bit of acidity which can be neutralised but adding a bit of sugar. I followed the recipe from here, with absolutely no deviations aside from using lime juice instead nigari as a coagulant. I started with 170 grams of dehydrated soybeans and ended up with about 3/4 cup of tofu. Mince together the scallions, garlic and ginger to a smooth paste. For some reason, I decided to do this using a mortar and pestle (yes yes.. insanity strikes) but I see no issue in going the way of the food processor. Saute this mixture in oil until the aromas are released and then add in the bean paste and red curry paste and saute to cook. Some oil will release when the mixture is cooked. At this point add the meat and cook. Do not add salt as you will be adding soy sauce shortly. Meanwhile, mix together the plum sauce, soy sauce and two cups of water. When the meat is almost cooked, add this mixture and bring to a boil. Reduce heat and simmer for a few minutes. Gently toss in the tofu and on low, cook until the tofu is warmed through. Mix the corn starch in 2 tablespoons of water and add to the mixture. Continue cooking until the mixture thickens. Remove from heat, garnish with scallions and serve with sticky rice. Adding as little water as possible, grind the okara and chillies to a smooth paste. Velveteers was started by Aparna, Asha, Alessio and Pam, who are passionate about different cuisines and food in general. Each month, we will attempt a new dish and share our experiences and the recipes we used. If you’re interested in joining the Velveteers, please feel free to drop by our food blogs and leave a comment or drop me a line at asha@forkspoonnknife.com.